There's an answer to your commuting woes! Commuting to work can prove to be exhausting with the traffic jam situation we have. On average, Filipinos spend 1,000 hours on being stuck in traffic every year—that's the true test of patience! Not to mention, a lot of time is wasted just by being on the road, too. Motorcycles can easily breeze through shortcuts inaccessible to four-wheel drives. Likewise, it's easier to find parking spots because they don't really take as much space. This means they get to arrive at their destination sooner and with less frustration. Bikers also have more time to get ready in the morning and make sure they're prepared to tackle the day. 2. They benefit from the unintended workout in every ride. There's a lot of leg and arm work required to back up your motorcycle, not to mention the balancing act you need to operate the vehicle. Did you know that something as simple as wearing a helmet actually strengthens your neck? To add, activities involving steering a motorcycle and moving it at slow speeds helps strengthen your core and thighs. Work it, girl! 3. They can get creative real quick. To a biker chick, it's all about the essentials. They only carry things that fit easily in the motorcycle's tank bag. They've basically mastered the art of traveling light, a skill we wish we can all emotionally muster. That said, a biker chick knows how to make the most of what she's got. Need a quick fix to helmet hair? She's on it—with the only tools available, with an already stylish 'do in mind. 4. They've got more options. An advantage motorcycles have over cars is the convenience of being able to pull over anywhere, anytime. This is why automatic motorcycles just like the Yamaha Mio Sporty are a good choice for the city life. They're easy to use and they come in cute color choices, too! You can easily hop from one street to another and end up at a shop or bar, no sweat! You can even pick up a friend along the way. Being a versatile mode of transpo, the possibilities are endless! 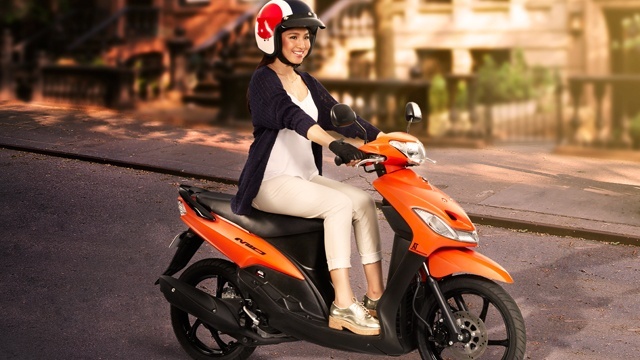 Nadine Lustre rides a Yamaha Mio Sporty. 5. They're living on the edge! Motorcycles require an extra level of mental alertness. It's a good companion for girls who need a temporary escape to recharge. Everybody can benefit from a little alone time, am I right? 6. They have access to cool motorcycle clubs. There's nothing quite like socializing with people who share similar passions and interests. Motorcycle clubs feel like a 1970s bike gang throwback, but it's actually a good place to network and to form a deeper love for the lifestyle. 7. They share their part in saving Mother Earth. Unlike cars, motorcycles use less fuel and produce less carbon emission, so you get to zoom past skylines knowing you're doing your part for the planet. Plus, motorcycles are less expensive to maintain which saves you time and money, too. Talk about hitting two birds with one stone! Talk to any female biker and they'll tell you that riding, especially riding solo, has given them more confidence. Controlling a motorcycle and exploring new places strip them of their inhibitions. On top of this, riding used to be just a "guy thing," so another perk of owning a motorcycle is completely shattering a gender stereotype. You do you, girl! This article was created by Summit Storylabs in partnership with Yamaha Mio.